The report of the second battle in Kiev of the 2009 Season: Battle Dream Town, which took place on November 14-15, 2009. Summary of the Classics (Individual Classic Freestyle, Speed slalom, and Slides) which took place on May, 29 and 30. Here is the Report of Battle "Objective: Cone" (first round of the French Slalom Series 2009) which took place in Le Havre during the Weekend de la Glisse Festival, on the 9th and 10th May 2009. 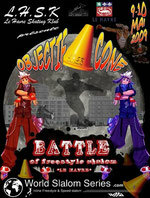 Report of the 2nd Italian Freestyle Battle of 2009, which took place on the 2 and 3 Mat 2009 at Ancona. 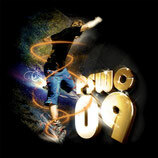 Report of the 2009 WSSA European Championship, which took place in Moscow at Adrenalin Skatepark on March, 20-21. Report of the SPB Battle which took place in St. Petersburg on March, 14th '09. The second edition of Dakar event was a success, about 44 skaters came from many different cities of Sénégal to join this event and to show very good performances. For the second consecutive year, Eric Torres (Sen) won the battle final in front of Carlos Biagui (Sen) and Ibrahima Mboup (Sen). The women's final has been won by Maïmouna Sabaly (Sen). Mbisane Diallo (Sen) coming from city of Thies, won the final against Babacar Ndiaye (Sen). Celia Goncalves (Sen) won the women's final. The first slalom contest in Argentina was held in Buenos Aires, and then another competition was held 1 week later in Mar Del Plata. 3 victories for Braian Gonzalez (Arg) who won the men's battle final of Buenos Aires in front of M.Kobayashi (Bra) and D.Leys (Arg) and the final of Mar del Plata in front of A.Villareal (Arg) and D.Leys (Arg). He won also the speed slalom final of Mar del Plata against P.Wasielewsky (Fra). A. "Mapu" Iriarte (Arg) won the speed slalom final in buenos Aires. In the women category, 2 victories for Jenifer Wolkowyski (Arg) who won Buenos Aires Battle and Mar del Plata Speed slalom final. A.Malladott (Arg) won the speed slalom final in B.Aires. Singapore National Freestyle Championship was held on November 14th, 2009. Clarence Cheung won 2 national titles since he won both freestyle classic and speed slalom competitions. Wen Tay Shu won the title in classic women and Rebecca Chew Rui Jun won the title in speed women category. Martin Sloboda (Ger) won the battle men's final against D.Shevarutin (Rus), V.Meleshkevich (Rus) and R.Gordin (Rus). Polina Semenova won the women's final against M.Boyko (Ukr) and C.Seyres (Fra). Chloe Seyres (Fra) won the speed slalom women's final against K.Lysenko (Rus). Roman Gordin (Rus) won battle men's final and Marina Boyko (Ukr) won women's battle final. Kirill Ryazantsev (Rus) won speed slalom men's final and Kristina Lysenko (Rus) won speed slalom women's final. Malaga hosted the final of the Spanish slalom series 2009. Adrian Almazan (Spa) won the mixed final and the spanish battle title in front of Jorge Teba (Spa) and Paul Randles (Spa). First women is Ana Borrego and Zaira Tari, both 13th. In Köln was held the last event of the german slalom series 09. Martin Sloboda (Ger) won the men's Battle final, in front of Rudy Op't Veld (Ger) and Antoine Colange (Fra). In the women category, Anya Ziertmann (Ger) won the final in front of Fanny Violeau (Fra) and Miriam Kwasny (Ger) . The final of the French Slalom Series 09 was held in Lyon, during Lugdunum contest - Final Arena. The best French slalom skaters came to win the final title and also some skaters from belgium, italy, germany and russia. Igor Cheremetieff (Fra) won the men battle final in front of Antoine Colange (Fra), Xuan Le (Fra) and Kyan Sanchez (Fra) in a very tight final. Chloe Seyres (Fra) won the women battle final against Fanny Violeau (Fra), Emilie Audrezet (Fra) and Claire Ploton (Fra). In the speed slalom competition, Alexandre Claris (Fra) won the final against Igor Cheremetieff (Fra). Sebastien Trocars (Fra) won the 3rd place duel against Daniele Lenzi (Ita). Chloe Seyres won the women speed slalom final against Fanny Violeau (Fra). Emilie Audrezet (Fra) took the 3rd place against Sara Masi (Ita). Streetlife Festival, Munich, Germany, was the 3rd step of German slalom series. Martin Sloboda (Ger) won the battle final, in front of T.Ferrari (Ita) and A.Colange (Fra). Double victory for Barbara Bossi (Ita) who won the women battle final against Anya Ziertmann (Ger) and C.Lualdi (Ita) ; and the speed slalom final against C.Lualdi. T.Ferrari won the speed slalom final against M.Gurevich (Rus), S.NAi-Oleari (Ita) finished 3rd. The 1st edition of Gdansk competition was held in Poland. K.Kudyk (Pol) won the battle men's final in front of P.Martynek (Pol) and R.Knewski (Pol). P.Martynek won the speed final against J.Parulski, R.Knewski finished 3rd. Double Victory for Lidia Wardzinska (Pol) who won battle and speed slalom final. Triple victory for C.Seyres (Fra) who won women's Battle, Classic and Speed Slalom competitions. P.Pinyojarassang (Tha) finished at 2nd place in Classic and Battle competitions, and took the 3rd place in Speed Slalom. Hsiang Wen-Ju (Tpe) finished 3rd of the battle final. Shin Hyo-Jae (Kor) took the second place in Speed slalom and 3rd place in Classic. In the men competition, Igor Cheremetieff (Fra) won both speed slalom and classic finals, and finished at second place in battle behind Martin Sloboda (Ger), who took the second place in classic freestyle. Rudy Op't Veld took the 3rd place in Battle, and Xuan Le (Fra) finished third in the classic. Jb Milleret (Uk) took the 3rd place in the speed slalom contest. The 2nd edition of the WSSA World Championships, supported by FIRS was held in Shanghai, China. Chinese skaters won the most of gold medals, Chen Chen won 2 world titles, in Classic and Battle Freestyle slalom, she got the more points in Classic in front of Qin Chun Yan (Chn), and P.Semenova (Rus). She won the battle final, in front of N.Zelenova (Rus) and C.Seyres (Fra).Bao Hui Fa (Chn) won the Classic men, in front of Zeng Jian Bo (Chn) and Liao Jie (Chn). Lan Wang Heng kept his 08 title in Battle, as he won the final 09 in front of M.Sloboda (Ger) and I.Cheremetieff (Fra). Guo Fang (Chn) won the speed slalom men final against Liao Jie (Chn), Igor Cheremetieff took the 3rd place. Severine Thomas (Fra) won the speed slalom women's final against C.Seyres (Fra), Chen Chen took the 3rd place. Skate London was very successful event ! About 90 skaters from about 17 countries ;) took part in the competitions. Double victory for Barbara Bossi (Ita) who won both Speed slalom and Battle Finals. Another victory for Martin Sloboda (Ger) who won the men's battle final. "Tizzzi" Ferrari (Ita) won the speed slalom men's final. New victory for Martin Sloboda (Ger) who won the Men's battle final against Rudy Op't Veld (Ger), Igor Cheremetieff (Fra) and Xuan Le (Fra). Chloe Seyres (Fra) won the women's final against Polina Semenova (Rus), Anya Ziertmann (Ger) and Fanny Violeau (Fra). Italian skaters dominated the speed slalom, since Davide Piacentini won the men final against Tiziano Ferrari, and Simone Nai Oleari finished 3rd. Barbara Bossi (Ita) won the women's final against Chloe Seyres, and Chiara Lualdi took 3rd place. A freestyle slalom competition was held in Bangkok, Thailand on July 25-26. Triple victory for Pichaya Pinyojarassang (Tha) who won Speed, Classic and Battle contests. Munich Fun Battle, Germany was held on July 18-19th. This event is counted as local event in the World Slalom Series. Double victory for Anya Ziertmann (Ger), she won battle final against Rebecca Matscha (GER), Daniela Ungureanu (ROM) and Daniela Horky (GER) ; she also won speed slalom final against Rebecca Matscha (GER). Martin Sloboda (Ger) won the battle final in front of Andre Stepczak (GER) & Mischa Gurevich (RUS). Mischa Gurevich (RUS) won the speed slalom final against Martin Sloboda (Ger). For its first edition, battle Belgium was very successful, about 50 skaters from 9 countries joined the event to offer a great show and great performances !! Chloe Seyres (Fra) is the women of the week-end, since she won both Battle and Speed finals. Barbara Bossi (Ita) took 2 second places in Battle and Speed Slalom. Megan McIntosh (Usa) took the third place in Battle and Miriam Kwasny (Ger) took the 3rd place in Speed Slalom. Davide Piacentini (Ita) is the surprise of this week-end since he won the speed slalom final against world number #1 Tiziano Ferrari (Ita). Jb Milleret (Uk) took the 3rd place. Igor Cheremetieff (Fra) is confirming his good period by winning a 3rd battle final in a row after Kiev and Warsaw. Xuan Le (Fra) took the second place and Tiziano Ferrari the 3rd place. Another double victory for Igor Cheremetieff (Fra) and another victorious battle for Nadezhda Zelenova (Rus) !!!! I.Cheremetieff (Fra) won again in Warsaw, after his Kiev victory, for his first participation to this event. He beated in a beautiful battle final Dmitryi Milyokhin (Rus), Xuan Le (Fra) and M.Gurevich (Rus), the 08 title holder. In the speed slalom final, Igor beated S.Laffargue (Fra) in 2 runs. M.Gurevich (Rus) took 3 rd place, beating the fastest polish skater, J.Parulski. N. Zelenova (Rus), showed again she is the most technical skater of the moment, with her double wheeling transitions and very nice sevens, she beated again World champion 08 C.Seyres (Fra). Lidia Wardzinska (Pol) took a very good 3rd place, in front of M.Kwasny (Ger), 4th. C.Seyres, still won the speed slalom final, against L.wardzinska ; M.Kwasny took 3rd place beating W.Konczakowska (Pol) in the consolation final. Double victory for Igor Cheremetieff (Fra) in Kiev, French best skater, and freestyle world n.#5, won the battle final against D.Shevarutin (Rus), 2nd, R.Gordin (Rus), 3rd and A.Shitov (Rus), 4th. He won the speed slalom final as well against A.Tsokolov (Rus). S.Laffargue (Fra) took the 3rd place against A.Shitov (Rus). In the women battle, after her victory in Paris, Nadezhda Zelenova (Rus) won again in Kiev, in front of C.Seyres (Fra), and M.Boyko (Ukr). K.Lysenko (Rus) won the speed final against C.Seyres (Fra) ; O.Fadina took the 3rd place. Grenoble Glisse Festival was the 4th step of the French Slalom Series 09, held on June 27th 28th. Xuan Le won the battle final in front of Igor Cheremetieff, Antoine Colange and Kyan Sanchez. Igor cheremetieff won the speed slalom mixed contest, beating in final Sebastien Laffargue, Chloe Seyres took 3rd place and won the women battle final in front of Sophie Lovato and Alice Lacouture. With his victory, Xuan Le is sure to win the wssa french national title in battle category, as well as Chloe Seyres who is sure to win the women title in battle category. Igor Cheremetieff is also sure to be on the second step of podium for battle category. In Speed Slalom, Igor Cheremetieff has the best chances to be 09 Champion, but Sebastien Trocars can still win the French title, only if he wins the final in Lyon. In the women category, the title can go to Fanny Violeau or Chloe Seyres, depending on Lyon result in September. For the rest of the podiums, several skaters can reach it in men and women categories, and the results of the last step in Lugdunum Contest of Lyon will decide. We expect a very interesting final in Lyon. The 3rd edition of Battle US was held in Boston, on june 20-21, 2009. Igor Cheremetieff (Fra) won the battle final against Xuan Le (Fra), John Stanning (Aus) and Tim Schraepen (Bel). The national title has been won by Eriald Karakosta, from NYC in front of Jeremy Lacivita, 2008 US champion and Megan McIntosh, from Boston. A Slalom contest was held in Voronezh, Russia on May 9-10, counting for Russian ranking and also as local event in the World Slalom Series, V.Meleshkevich (Rus) won the freestyle classic men contest in front of A.Rychkov (Rus) and R.Gordin (Rus) ; In the freestyle classic women : A.Babiy(Rus) did the best run in front of J.Isaeva (Rus) and E.Surmach (Rus). A.Tsokolov (Rus) took the 3rd place. K.Lysenko (Rus) won the speed slalom women final against E.Surmach (Rus) ; J.Isaeva (Rus) finished 3rd. The 3rd step of the French Slalom Series 09 was held in Dijon, on June 14th. Xuan Le won the mixed battle in front of Igor Cheremetieff and Romain Lebois. Kyan Sanchez took 4th place. Emilie Audrezet is the first women by taking the 8th place ; she also won the Speed slalom women final against Audrey Ranemachise. Barcelona Extreme was held on June 6-7th, in Spain. Triple victory for Igor Cheremetieff (Fra) who won mixed Battle competition in front of Xuan Le (Fra), Rudy Op't Veld (Ger) and Jon Larrucea (Spa) ; he won also Speed slalom contest beating Jorge Teba (Spa) in final and Slide contest in front of S.Laffargue (Fra) and G.Pinto (Fra). Victor Bermudez (Spa) took 3rd place in the speed slalom contest, beating A.Almazan (Spa) in the small final. PSWC 09 was a great success !! With about 120 competitors from 18 countries who took part in different categories, it was the biggest event ever ! Kim Sung Jin (Kor) did the best performance, winning the Battle final, the Classic men contest and taking the 3rd place in the speed slalom contest. In the Battle Men competition, Martin Sloboda (Ger) took 2nd place in front of Terence Cheung (Sin) and Xuan Le (Fra). Tiziano Ferrari (Ita), speed slalom world n.1, confirmed his success in Russia by winning again in Paris, beating french Romain Lebois in Final. In the women category, Nadezhda Zelenova (Rus) won the Battle final against World Champion Chloe Seyres (Fra), and the 2 other russians Polina Semenova and Lika Babiy. Chiara Lualdi (Ita) won the speed slalom women's final against Barbara Bossi (Ita), Chloe Seyres took 3rd place beating Fanny Violeau in small final. C.Seyres won the Classic freestyle contest in front of C.Lualdi and A.Babiy. A slide contest was also organised, and Kirill Ryazantsev (Rus) won the final against Jireh Go En Cih (Sin) and Yohan Fort (Fra). A local classic freestyle slalom contest was held in Sao Paulo, Brazil, on May 8th. Marcelo Kobayashi (Bra) won the competition in front of Luana Carolina Gonçaves Serrano and Prinscken de Jesus da Silva Rodrigues. A Freestyle slalom contest was held in during ASPO Spring Festival in Okayama, Japan. The second Itlalian Slalom Battle was held on May 2nd in Ancona, Italy. Igor Cheremetieff (FRA) won the battle men's final in front of Xuan Le (Fra), Sebastien Laffargue (Fra) and Luca Ulivieri (Ita), who won the speed slalom final against I.Cheremetieff. Savio Brivio (Ita) took 3rd place. In the women competition, Chloe Seyres (Fra) won the battle final in front of Barbara Bossi (Ita) and Chiara Lualdi (Ita). Barbara Bossi won the women's speed slalom against C.Lualdi in the final ; Sara Barlocco (Ita) took 3rd place. Beijing Slalom Open was held on April 23-25th. Kim sung Jin (Kor) won battle final against Guo Fang (Chn) and Rudy Op't Veld (Ger). In the women category, Chloe Seyres (Fra) won the final against Polina Semenova (Rus) and Chen Chen (Chn). Zeng Jian Bo (Chn) won Classic freestyle contest in front of Kim Sung Jin and Kim Tae Bin (Kor). Meng Yun (Chn) won women freestyle contest against Chen Chen (Chn) and Chloe Seyres (Fra). In the speed slalom competition, Lan Wang Heng (Chn) won the final against Kim Sung Jin (Kor). Guo Fang (Chn) took 3rd place. Ye Run Shi (Chn) won women speed final against Yu Qian Qian (Chn) and Deng Ling (Chn). The March World Ranking is now available ! After latest competitions, many changes happened. Classic Slalom World Champion, Guo Fang (Chn) is new World n.1 in freestyle slalom men, while Chloe Seyres take back the 1st position in the women ranking to Chen Chen (Chn). In the Speed slalom ranking, Europe Champion Tiziano Ferrari (Ita) is new World n.1. Many other changes happened, check the World Ranking ! A.Almazan (SPA #21) won the final against J.Teba (SPA #132), V.Bermudez (SPA #36) and J.Gandara (SPA #359). This year again Battle Moscow was a great success. In the women category, Chloe Seyres (Fra) won the first wssa european title, winning the final in front of P.Semenova (Rus) and A.Babiy (Rus). Martin Sloboda (Ger) only 14 years old, won the title in the men category, in front of D.Shevarutin (Rus) and V.Meleshkevich (Rus). A good surprise in the speed slalom women category, since K.Surmach (Rus) won the final against world n.1 C.Seyres, K.Lysenko (Rus) took 3rd place. In the men category, Tiziano Ferrari (ITA) won his first main title beating A.Shitov(Rus) in the final. I.Cheremetieff (Fra) took bronze medal. The world ranking will be affected by those results, since C.Seyres reaches the first place in freestyle slalom, T.Ferrari reaches the world first place in speed slalom. Title holder I.Cheremetieff (5th place in battle) is losing his leadership in favor of Guo Fang (Chn), 2008 freestyle classic world champion. The first battle of St petersburg was held on March 14th. About 50 skaters took part in men and women battles. In the men category, Dmitry Shevarutin (Rus) suprised everybody by winning the final against Battle World n.1, Igor Cheremetieff (Fra), A.Shitov (Rus#56) took 3rd place and V.Meleshkevich (#35) finished at 4th place. In the women category, N.Zelenova (Rus #15) won the final against P.Semenova (#3), A.Babiy (#21) and C.Seyres (#2) who did too many mistakes to go on the podium. Igor Cheremetieff (Fra #1) won the men battle final in front T.Ferrari (Ita #7) and Luca Ulivieri (Ita #61) who won the Speed Slalom final against S.Nai Oleari (Ita). S.Brivio (Ita) took Speed 3rd place. Double victory for Barbara Bossi (Ita) who won the battle women final against C.Lualdi (Ita) and B.Codazzi (Ita) and the speed final against C.Lualdi. The first Basic event of 2009 season was a great contest ! Rudy Op't Veld (Ger) won the battle final against I.Cheremetieff (Fra), M.Sloboda (Ger) and X.Le(Fra). Chloe Seyres (Fra) won the final women against A.Ziertmann (Fra), M.Kwasny (Ger) and S.Beyen (Ger). In the speed slalom, S.Brivio (Ita) beat T.Ferrari (Ita) in the final, and S.Trocars (Fra) beat X.Le (Fra) in the small final. C.Seyres (Fra) won the women speed competition. The first Italian battle of the season will be held in Rome, on March 8th. The event will be inside a bigger event with other inline sports. The first step of the Spanish Slalom Series 2009 was held on Jan.24th. A.Almazan (Spa) won the battle final in front of J.Larrucea and V.Bermudez. The first WSSA European Slalom Championship will be held in Moscow, Russia, on March 20-21st ! This event is organised by Rollerclub and should gather the best european skaters who will fight in Speed and Freestyle Battle for the WSSA continental title. It is possible for skaters to plan this travel with St petersburg battle to do 2 events in the 2 most beautiful cities in Russia. The first Battle in St Petersburg, Russia, will be held on March 14th ! It will be held in the brand new city skatepark, which had it's grand opening few days ago ! The final 2008 WSSA world ranking is now out ! World Slalom Series 2008 gathered in 38 events, 629 skaters from 33 countries in freestyle slalom, and 400 skaters from 27 countries in Speed Slalom. The 2008 World Championship was held in Singapore on Dec. 13th and 14th. Guo Fang (Chn) is the new classic freestyle and speed slalom world champion. Lan Wang Heng (Chn) is the 1st battle freestyle world champion. In the women category, C.Seyres (Fra) won 2 World Champion's titles in speed slalom and battle. Chen Chen (Chn) won the classic freestyle title. Jireh Goh (Sin) and R.Chew Rui Jun (Sin) are the first freestyle slides WSSA World Champions. Kim Sung Jin / Yu Jin Sung (Kor) won the Jam title.